Coffee - it's the elixir of life, the glue that holds our society together. OK maybe that's overstating it a bit, but there's no question that coffee plays an important part in our work and social lives. Many important life events include the drinking of coffee - funerals, weddings, reunions, first meetings. How would we get through the work day without a coffee break? Such is the premise of the delightful sketch comedy show 2 Sugars, Room for Cream. In a series of short scenes, some of which are related, writers and performers Shanan Custer and Carolyn Pool explore the nature of life and relationships through encounters over coffee. The result is a funny, poignant, real, engaging, and completely delightful show. In fact, it's so delightful that it keeps returning after starting as a Fringe show several years ago. And Ivey voters agree - the show recently won an Ivey Award for last year's incarnation at Hennepin Theatre Trust's New Century Theatre. Even though I saw that production, I couldn't resist the chance to see it again (and yes, I am going to plagiarize myself). 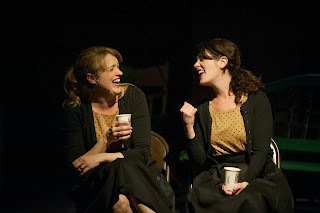 Shanan and Carolyn are quite charismatic and funny together, with great chemistry whether they're playing sisters, friends who haven't seen each other in twenty years, or people who have just met. They create different characters just by putting on a different sweater or jacket (what Stacy and Clinton would call a "completer piece"). The show opens and closes with one of the two scenarios that are visited multiple times - two sisters at their Uncle Jimmy's funeral drinking bad church basement coffee. They discuss their family and their lives, as the celebration moves to one of the sisters' homes and the coffee makes way for 2 Gingers whiskey, and the next morning, more coffee is needed. The other scenario with multiple scenes is a high school reunion, where two women meet, with one of them clearly remembering their relationship while the other does not. Again, coffee turns into drinking in the car and flirting with former classmates, which turns into hanging out at an all-night Denny's. Other skits include a diner waitress and her needy customer, two new friends discussing how Twilight is damaging to young women (thank you! ), a frazzled new mom crying about her baby's tiny head, a period piece set in the '40s, a college professor introducing her class, bosses and their assistants (separately) on a coffee break at work, and a woman recording a touching video for her unborn daughter about how she's going to raise her to be confident and proud of herself. Coffee-themed songs play during scene changes (many of which I know from this CD), and Carolyn and Shanan also sing a few original songs (written by Peter Moore and Drew Jansen). Shanan and Carolyn are so natural on stage, and are obviously having such a great time, that the audience can't help but enjoy themselves as well. 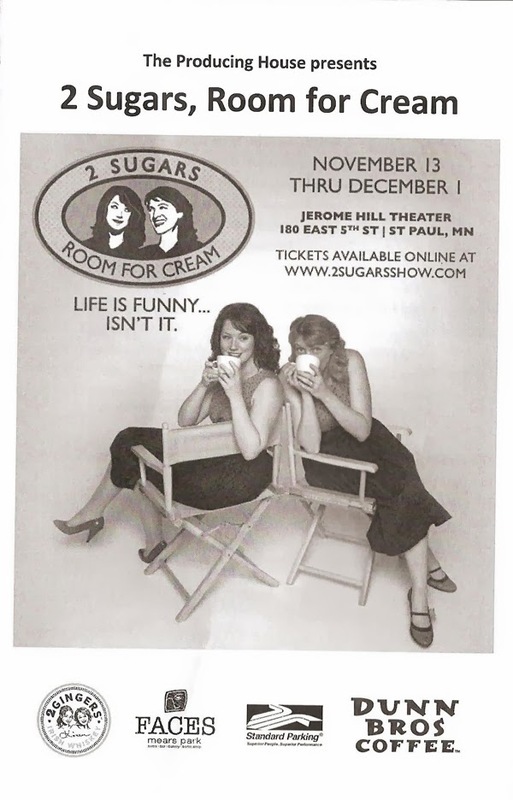 If you're looking for something to do this weekend post-turkey, check out the great deal on tickets at Goldstar and go see some original, creative, wonderfully entertaining and fulfilling theater at the Jerome Hill Theater in the gorgeous 180 East 5th Street building in downtown St. Paul.